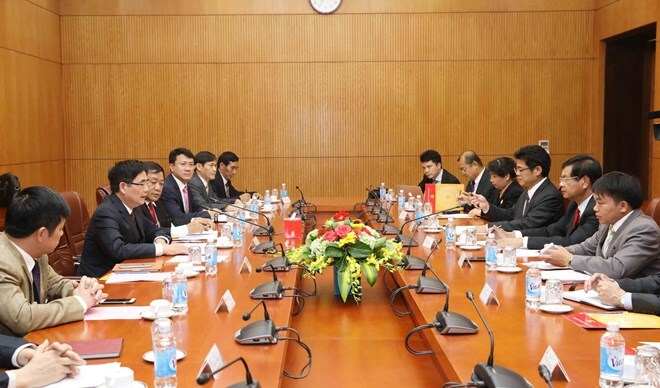 Hanoi (VNA) – Cao Duc Phat, deputy head of the Party Central Committee's Economic Commission, and Bouasone Bouphavanh, head of the Lao National Economic Research Institute, exchanged experience in building socio-economic development policies during a working session in Hanoi on March 19. The two sides compared notes on issues of mutual concerns such as building institutions of the socialist-oriented market economy, reforming State-owned enterprises, developing the private economy, restructuring the economy, and building and implementing the Party’s resolutions on the aforesaid fields. Phat shared Vietnam’s experience in protecting intellectual property, developing the cooperative economy, reforming economic sectors, and strengthening the Party leadership and State management to obtain rapid and sustainable economic development. Bouasone Bouphavanh, who is former Lao Prime Minister, congratulated Vietnam on its socio-economic achievements gained over the past time.